Another excellent issue for The Rise and Fall of Captain Atom. Bates and Wiseman play with the best elements from the 80s series, but also take things in a bit of a different direction. The villain of the issue, Ultramax, has an origin that was so close to that of Major Force that I was sure we were seeing that bad guy’s re-introduction. Instead, we were given a completely new enemy for Captain Atom, a considerably different one. Like both Captain Atom and Major Force, Ultramax’s powers are linked to the quantum field. Like Major Force, he is a dangerous psychotic. But Ultramax, before his transformation, was a paid hit man. One of his former clients turned him in to the police. Unsure of who this was, Ultramax sets out to kill every person who had hired him in the past. He gets a lot further with this plan that he should, but Captain Atom has his own agenda. He is trying to connect with the son he never really knew. It’s exquisitely painful, as he can only do this by lying to the boy and pretending to be someone else. Effectively, he is burying himself even further with this child and their potential relationship, but he sees no other way to get close to him. The web of lies, both well intentioned and coldly manipulative, continue to grow and tie together the various characters in the book. The concluding revelation will come as no surprise to anyone who had read the series from the 80s. Honestly, I saw it coming pretty much from the start of the issue. But it didn’t bother me because of that, it was a fulfilling pay off. 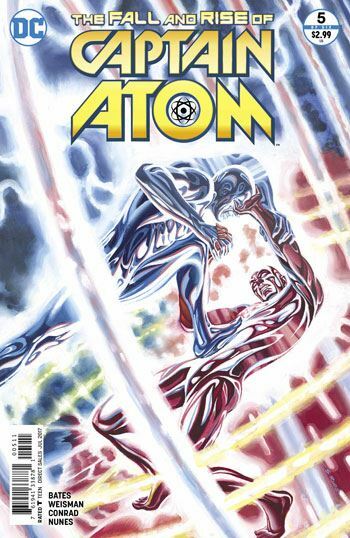 I really hope this miniseries does well enough to launch a new Captain Atom book. It’s been a great Rebirth for the hero.